With responsive practically becoming the standard, itâ€™s harder than ever to define the best size for a website. Before responsive became mainstream, we used to base our design width on which screen sizes were popular at the moment. This way you knew that at least way a large portion of your sitesâ€™ visitors would see the site as you intended. But as screens became bigger, so did our websites. Only to be followed by smaller screen sizes, due to smaller laptops becoming popular. Luckily responsive sites solve a lot of this bouncing up and down so you can make you website look good on most screens. But it still doesnâ€™t answer the question of what is the best size for a website. Time to do some research. Letâ€™s first look at some of the most popular screen sizes over the years. According to the data Statcounter (a popular free visitor counter) provides, 1024×768 was the most popular size up until March 2012. That month it was surpassed by 1366×768, which is still the most popular today. The difference between these two sizes? 1366×768 is widescreen with a 16:9 ratio, where 1024×768 has the more traditional 4:3 ratio. This shift marks the change from regular desktop monitors to the still very popular widescreen laptops. The 1366×768 size is just for display screens ranging from 10.1 to 16 inch, but you can imagine it wonâ€™t look that pretty on the latter. So itâ€™s safe to say that if you decide to use a static size, 1366×768 is your safest bet. That is if you cater a general audience. 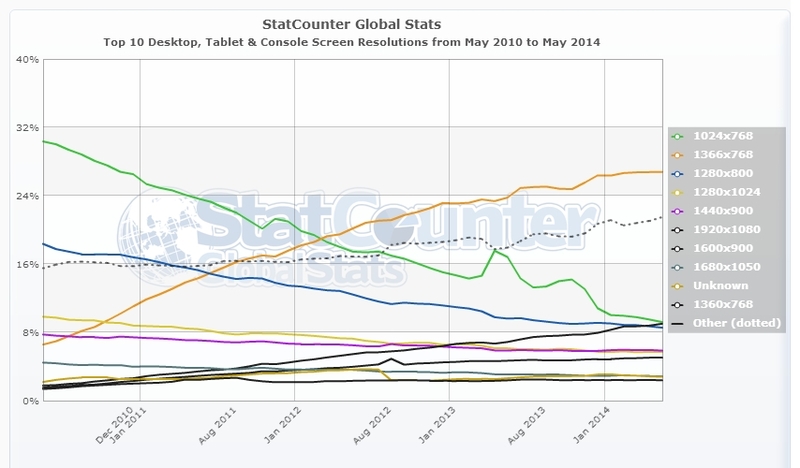 1920×1080 (Full HD screens) is on the rise too, especially with a tech oriented audience. This means these people will see your 1366×768 site with large empty spaces left and right. And did you see the large â€œOtherâ€� line in the StatCounter screenshot? Thereâ€™s just a whole range of different screen sizes to design for which donâ€™t fall in the listed size categories. Thatâ€™s where responsive comes into play. Making a site responsive is more popular than ever. It allows for one design which is displayed full width on any screen size. Adapting a websitesâ€™ view size is regulated with CSS and is based on the viewport of the device a visitor is using. The viewport is the visible part of your website, without scroll bars. Annarita wrote an excellent article about the concepts of responsive design here on SitePoint.com. You can read it here. A general assumption is that you can use a responsive design to make a website look good on any type of device. That is not entirely true. A responsive design makes sure that the maximum view space of each device is used when viewing your site. It basically means no horizontal scroll bars. But that doesnâ€™t mean it will actually look good. To see a live example, please have a look at one of my sites which uses responsive design. It uses a full page background image which I believe looks great on a Full HD monitor (which Iâ€™m using myself). The sidebars are still on default settings. The WordPress theme I use is optimized for responsive, which means, for example, even the call-to-action â€œApplyâ€� boxes scale down. Now re-size your browser, and see what happens. The sidebars are moved below the main content, therefore losing their use as sidebars. They become just a bunch of boxes for which no one will take the effort to scroll down to see them. Imagine if you HAD ads put in there: this will severely reduce your earnings. It looks even worse on mobile, toO crammed up which makes your small mobile screen feel even smaller. While I donâ€™t like the sidebars below the content, I wouldnâ€™t want them placed in between content either. I may be a bit biased since I really donâ€™t like responsive (I decide to buy a larger phone and use desktop sizes instead), but you have to be really creative if you want to make proper use of sidebars. You basically have to accept the fact that you need to include your most important links and ads in-content or they probably wonâ€™t get seen. But you need to be very sure this design still looks good on desktop or tablets (for which you should disable responsive), since itâ€™s bound to mess up your layout if you donâ€™t keep an eye on it. Responsive design works better for layouts which donâ€™t include sidebars in the first place. But thereâ€™s only so much room on smaller screens, so even with an optimized mobile layout you need to decide which content you want to show the most. So is responsive the best â€œsizeâ€� for a website? Probably yes, but life was much easier when we were all just using the same screens. Let me know in the comments what you think is the best size for a website, or what your thoughts are on responsive design in general.